Genomics, the reading and interpreting of information contained within DNA, is a rapidly growing area with far-reaching implications from the laboratory bench to the patient's bedside. To address the evolving implications of genetics and genomics in medicine, the Molecular Genetics Department at The University of Toronto is launching a new professional Master’s program in Medical Genomics in September of 2018. This program is the first of its kind in Canada, and on behalf of the MedGen Program Team, we would like to invite you to join us for an information session and networking event! If you are an enthusiastic and engaged student with a clinical or B.Sc. 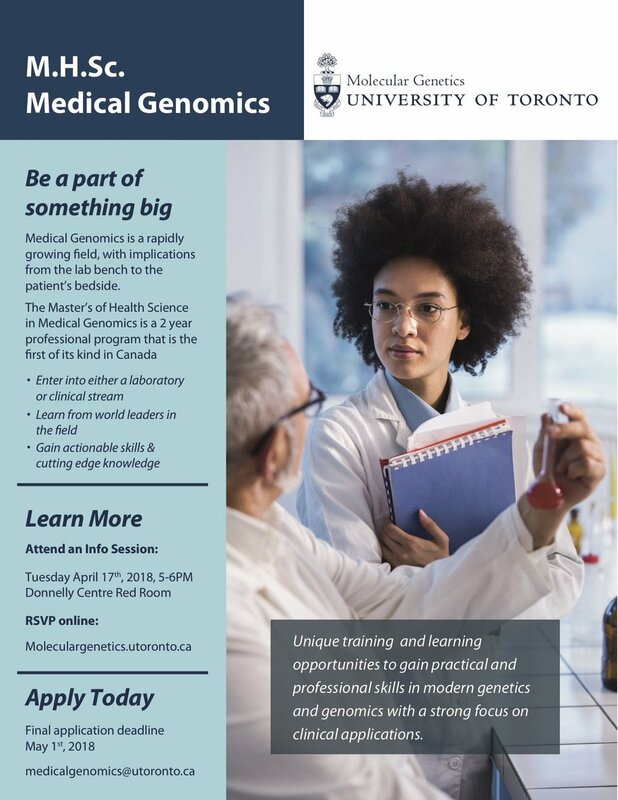 background, and you're interested in pursuing a career in medical genomics, please join us on April 17th, 2018 from 5PM-6PM to learn more about this Master's program. You will have the opportunity to meet and ask questions to the core teaching faculty in this program and key departmental leaders, and to find out if UofT's Medical Genomics program is a good fit for you.